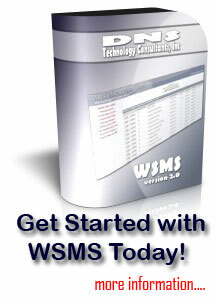 The WSMS has two types of navigational links that can be displayed on your web pages. There are site wide links and page links. You have the ability within a page to turn off your site links, or you can have the page display both types of links, or you can just use the site links throughout the entire website. If you elect to use the text links within the footer of the webpage, then it will only display the site navigation links. Both page links and site links can be modified using the same utility. Click on the Modify Site Links from the administrator's menu. Within the utility you can add a link, modify a link, or delete a link. You can also change the order of the links. You also have the ability to open the target in the same window or a new window as a pop-up. Display As - this is what will be displayed for the link. URL - this is the URL (Uniform Resource Locator) for the link. Here you want to put what page will open when someone clicks on the link. Pop-Up Text - this is the text that will pop-up on the screen if someone moves their mouse over the link. It can also be considered help text. Target - By default you will have the Same Window; however, if you want the links to pop-up in a new window then change the option to new window. Order - This is the order of all the links within the list. After adding a new link, you can treat it as all of the other links as far as; just modify the information and move off the field then the changes are automatically saved. At the top of the Order column, there is a refresh icon that will reorder your listing of links if you change their order.